Looking for a New Apartment? Click Here and we will get back to you! 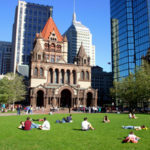 Copley Square Park in the Back Bay of Boston, MA features Trinity Church and the John Hancock Building.